Social "things" have replaced traditional ways of communication like sms and mails. One day i needed a new, fast, mobile and snappy way of communication. So i made Comunikino. It consists of two main parts, a script in python that runs on the PC and a box that goes on desktop connected through an USB cable used for data and power (no external power needed if you use a 500mA capable usb port!). You need to create a mailbox for Comunikino with pop access, i raccomend to use gmail as many providers don't offer pop access for free mailboxes. 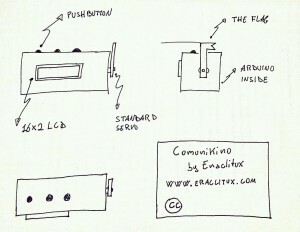 Using Comunikino is simple, just send a mail to its mailbox and the subject will be printed to its LCD (max 16 chars). Who reads the message can use one of three Comunikino's buttons to send a mail back to the address setted in python script to say yes, no or readed (this button can also to be used to say: “hey! I'm thinking of you”). Simple, isn't it? Do you believe that? Google made up a Chrome (and Chromium) extension to let you bypass Analytics's tracking code on every website you visit. So if you work on a website and don't want to perturb site stats or if you are jealous about your privacy this is for you! You can download it on Chrome web store. Let's see how easy it is to communicate with an Arduino 2009 board and the pySerial python's module. What we will do is to use python to send characters serially to an Arduino 2009 which will send them back. Everything here has a demonstration purposes only, since the code proposed here has no specific function but you can easily modify it to get something usable for your projects (take a look at Comunikino for example). The methods has been tested on Ubuntu 10.04 but should work on other distributions as on various Windows and Mac OSX with minimal modification.